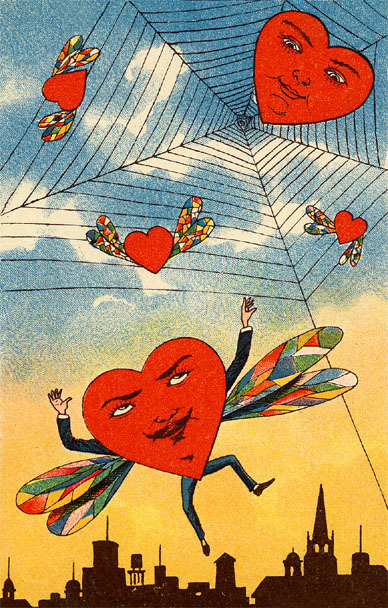 ZP_A vintage Valentine’s Day postcard_1930s?_Note the absence of cutesy sentimentality or smarmy earnestness. Depicted are The Wiles, The Game, of Love. 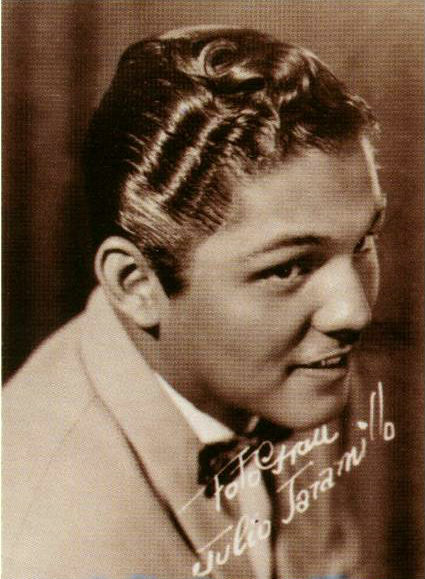 Anyone hearing the 1957 recording of “Our Oath” (“Nuestro Juramento”) by 22-year-old Julio Jaramillo – later known as “The Nightingale of The Americas” for his sweet high tenor – perhaps will be surprised to learn – once the words have been translated from Spanish into English – how extravagantly Romantic are the lyrics of the song. Benito de Jesús’ lyrics emphasize Death and Love together, and it’s easy to forget that the word Romantic (with a capital R) used to include both – though the saccharine cuteness of Valentine’s Day – with its boxes of chocolates and bouquets of a dozen red roses – has diluted in the public sphere the irrational intensity of that many-limbed emotion, Love. In fact, there is nothing more Romantic than the death of the belovéd. de Jesús’ outlandish – by contemporary standards – and absolutely un-ironic – verses, combined with the delicacy and sincerity of Jaramillo’s voice, make for a curiously disquieting yet moving popular love song. – because it kills me. with anguish fills my heart. make you cry at all. And if the dead may love? all the more, oh my! by everyone present will be read. full of feeling in my soul. so that our tale of love is told! Después de su grabación en 1957, el bolero “Nuestro Juramento”, del compositor puertoriqueño Benito de Jesús, se convertió en icono de la música ecuatoriana. ¿Y por qué? A causa del tenor dulce de un cantante nacido en Guayaquil – Julio Jaramillo. En esta canción extravagante de Amor, Jaramillo – conocido más tarde como El Ruiseñor de América – canta con mucha ternura el tema, y la letra habla de una emoción fuerte que traspasa los límites de la vida. Merece la pena recordar en este Día de San Valentín que no es siempre precioso y meloso el Amor (como chocolates y ramos de rosas). El Amor incluye la eventualidad de un gran Hecho amenazador en el horizante – la Muerte.